Copyright © 2013 Michelle Rebecca; all rights reserved; content may not be copied, rewritten, or republished without written permission. Weddings can be wasteful, from the hugely expensive dress thats only worn once to all the paper products that rarely get recycled. Many environmentally conscious couples are now looking for ways to green up their weddings so as to lessen the eco-impact of this special day. But—they also want to make smart financial decisions so that going green doesnt cost a lot of it. Here are some tips for couples looking to do an eco-friendly wedding on the cheap. Paper programs, invitations, and save the dates are lovely mementos for the bride and groom, but lets be honest: Most people toss these paper products shortly after opening the envelope or coming home from the event. This is one case where its okay to buck tradition and go electronic. 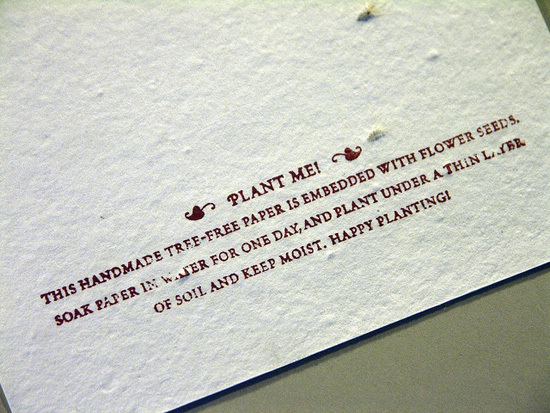 There are some lovely e-vites that are just as classy as paper invites. You can also make a program on your wedding site or use an app to create a program people can download onto their smartphones. These methods are much cheaper than ordering paper invites and can save you enough to upgrade in other areas of your wedding. Rather than buying a new dress that youll never wear again, why not go a non-traditional route? Shop for a vintage (aka used) wedding dress or have one made out of something near and dear to your heart. One post-World War II bride, for example, made her dress out of the parachute that saved her soldier husbands life after he jumped out of a plane under fire. This will save you thousands of dollars on a new dress as well as pricey alterations. Whether youre hiring a Caterpillar accugrade to even out your backyard reception area or a baker to make your wedding cake, make sure you check their green credentials in addition to their references and results. Dont mistakenly hire someone who does not hew to your vision of an environmentally friendly wedding or you will find yourself frustrated by all the needless waste. This approach may not appear to save money in the short term, but it will pay off longer term when you avoid losing your deposit because you abandon your first-choice vendor for one with more eco-friendly policies. What better way to pay tribute to your family heritage than to use heirloom wedding rings from a grandparent, great aunt or other family member? In addition to giving the jewelry sentimental value, they will be a lot cheaper than buying your own. Just be sure to repay your benefactor in some way, with a nice meal, role in the ceremony, or heartfelt thank you note. 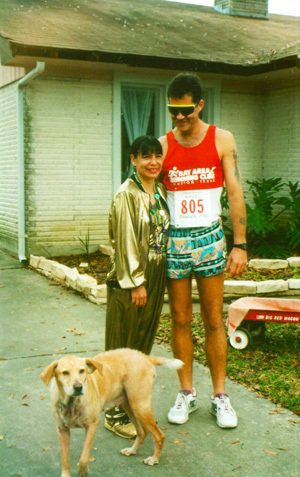 When my wife and I got married, I was heavily into the running/triathlon lifestyle. Being frugal (being a carpenter does that to one), and both of us not being into pretentious frugalities, we planned a 5K running wedding. The picture at the right shows our fancy attire (and my loyal yellow lab, Sugar-Dawg, who remained at my side during the vows, as should be the case with any man worth his ounce of salt). Wedding invitations? Very few since almost everybody of consequence read the posting in the running club and triathlon club newsletters. We had recycled race bib tags for everyone and all my buddies let me win the 5K, the only one I ever have. Instead of an expensive cake we had homemade cupcakes. Everyone who ran got a first place ribbon. The ceremony was performed in the driveway and and one of my working buddies showed up (unannounced; it was my secret) with his Southern rock/blues band (Nacho Mama) and rocked the neighborhood from the garage. Yes, they totally nailed Stevie Ray Vaughan. Do you think all this was for naught? No. All parents that brought small children loved it because the kids were able to spend their time on the front lawn with bubble swords rather than fidgeting in church pews. We got a lot of thanks for that! Also, and this is just me speaking, a couple of my friends that spent their time drinking too much free champagne and dancing on a rain-soaked driveway ended up getting married and having wonderful children.